The acquisitions represent a new strategy for Ambani’s Reliance Group, whose founder -- his father Dhirubhai Ambani -- built a petrochemicals business and the world’s largest oil-refining complex from scratch. It’s a clear pivot toward consumer offerings in a country that’s becoming a battleground for giants such as Amazon.com and Walmart Inc.’s Flipkart Online Services. “The deals may be tiny, but it’s more likely that they are putting together a team of talented people by acquisitions, who can then be invested in to build out larger platform products,” said Kunal Agrawal, an analyst with Bloomberg Intelligence. The service will seek to get on board the millions of mom-and-pop stores that dominate the Indian retail market, providing heft to its operations. Chains and large department stores account for only 10% the market. 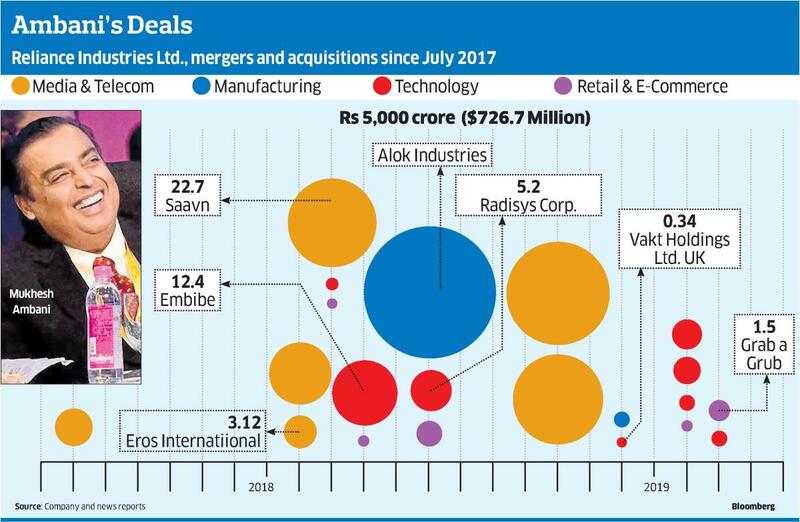 Radisys Corp. will help Reliance in enhancing its presence in the so-called Internet of Things and 5G in a bid to launch its broader e-commerce business, while Vakt Holdings will build a digital ecosystem leveraging block-chain technology. Grab a Grub will help Reliance deliver food, groceries and other merchandise using bikes as a delivery method in a hyper-local approach. Infibeam Avenues will help create e-commerce market places, according to a report by Mint. Ambani’s e-commerce plans have already won the support of investors. Shares of Reliance Industries Ltd. surged 45% in the past 12 months and touched a record high on April 1. The rally boosted Ambani’s net worth by $9.7 billion this year to $54 billion, according to the Bloomberg Billionaires Index. While Ambani puts together the building blocks to take on Amazon and Walmart, the broader fight is already taking shape in India. In a move widely interpreted as extending a helping hand to home-grown business, the government imposed late last year restrictions on the global giants, requiring them to cut cash-back payments and discounts -- methods that have been criticised by smaller sellers who’ve accused the companies of predatory pricing. “With its own telecom network, Reliance in India can go way beyond Amazon and Flipkart,” Technopak’s Singhal said.